This service is limited to 10 free queries per day. U.S. consumers only. 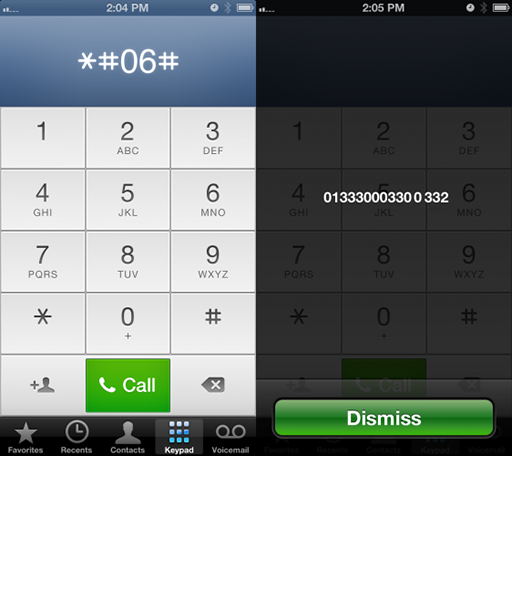 As a rule, you can find the IMEI number by calling *#06#. However, if this method does not work, this article explains all the other ways to do so. Enter the IMEI, MEID, or ESN into the field below. Please note, this service is limited to 5 free queries per day for U.S. consumers only. We provide a complete IMEI history, links and phone numbers so you could find all the financial information and technical specifications of your device that you need. Mobile phones or devices with a built-in phone/modem have their own unique ID, that's, an IMEI number assigned to all these devices when they are being made in factories. Every mobile, GSM modem or device with a built-in phone can be tracked by this number, and you can check some information about the device, brand or model. You can learn the device's complete IMEI history and find out if it has been blacklisted. You can find helpful links and phone numbers to find financial information about your device. Just enter the IMEI number and receive all information instantly. Note that sometimes a device has a MEID - Mobile Equipment Identifier. It’s pretty much the same as an IMEI. If you are on the fence and wondering why you should even consider iGotoffer compared to any other company on the market, let us break it down for you to help you decide. iGotoffer is a very honest company, that will offer the best price on the online market for you. Being honest means will probably also mean that you get a better deal with us compared to any of our competitors. We are not a new company, and have been on the market since 2011. We have a pretty good idea how to run things and our company only continues to grow with each year. We are a company who truly cares about our customers. We want to make sure all the items our customers send to us are insured and want to make the whole process as easy, and as smooth as possible… all while making sure our customers are also satisfied with our services and offers. We are a company run in the US. You know exactly what company you are dealing with and what they have to offer. We are also an eco-responsible company, so not only are we striving to provide the best service to our customers, but we are always working towards making the Earth a better place by recycling old electronics. To learn more about our company, feel free to visit About Us page.